I'm not going to let you off the hook regarding Haiti -- you'll be seeing more posts here about that nation as they rebuild from the earthquake and the poverty that long preceded it. But neither will it consume all of our attention, not when there's great music -- and great need -- elsewhere on the planet as well. "Our ancestors fought for our freedom and the pride of human kind," Kidjo says. "Each one of us has a responsibility to hold the torch and pass it on intact to the next generation." 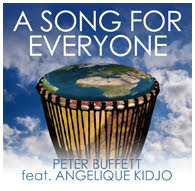 "Collaborating with Angelique was a wonderful surprise," says Buffett. "Her passion, energy and commitment - both to her music and in support of girl's education was incredibly inspiring." I'm not posting the mp3, 'cause that would kind of defeat the purpose of fundraising, right? But you can hear it free here. And you can buy it on Amazon for 99 cents.